Structuring model data by using Open Standards, IFC and Building Smart. Open BIM support a data structure where participants work in different software, but towards a common model in IFC. Use of OPEN BIM as basis for property definitions, quality control and in the exchange process. NIRAS is a multidisciplinary international company pro-viding both client consul-tancy, design and project planning services. NIRAS thrives on challenges and gets involved with all types and complexities of projects. Our focus is always on adding value to projects for our clients. We are pride of ourselves on having an enthusiastic and construc-tive approach using high end technology tools. 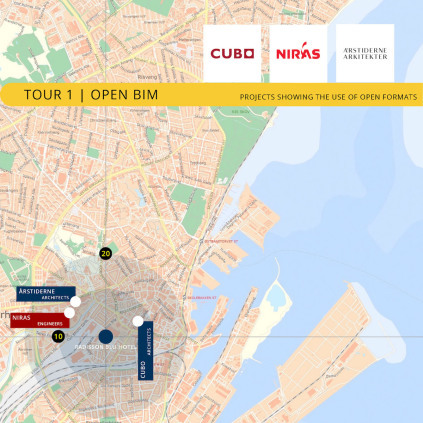 CUBO is keen to take advan-tage of the technological possibilities available today, while at the same time ensuring that the fine tra-ditions of craftsmanship, which are a fundamental part of Danish architectural histor find expression in new building schemes.